There are lots of little inlets from the ocean along the southern part of the Kerala coastline. We were told that the spits of land were man-made and on one side of them there were large rice paddies. Apparently during the rainy season, there is enough flow into these areas that the water is fresh and the rice can be grown. In the dry season it gets more salty. 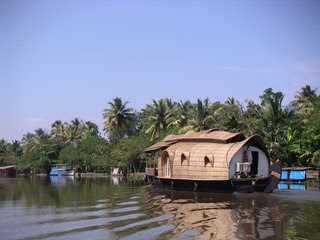 We had an idyllic 20-hour houseboat ride through these backwaters from Alleppey. The boats are a range of sizes b ut ours was about 40-feet long (see photos). The walls and roof are made from woven palm fronds and they are quite striking. We had 3 staff (the driver, the cook and the boss) and we were treated like queens. 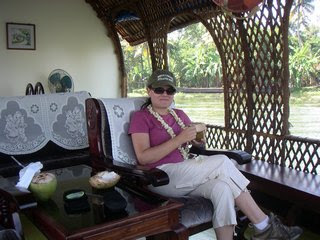 We sat on the deck in big armchairs, sipping on coconuts full of coconut water. It was quite hot out so we felt very lazy and enjoyed just sitting there reading, playing cribbage and looking at the scenery. The food was unbelievable. Kerala cooking is really delicious with lots of coconut and bananas. The stores in Kerala sell 4 or 5 different types of banana. We bought 3 huge prawns from a fisherman after lunch and had them at dinner. Our last few days we spent at a fairly touristy beach resort called Varkala, where we could actually put on a bathing suit and not feel self-conscious. We both had come down with colds by this time so it was good timing to be able to veg out for a couple of days. The food here was great too. We sat on top of a cliff and for the equivalent of about US$8 each would have a dinner of curried fish straight from the ocean and warm rice pu dding flavoured with cardamom for dessert. The fisherman at Varkala reminded me of how cheap labour must be in India. They would set out a large fishing net about a mile offshore using boats. Ropes would be attached to each end and brought to shore. 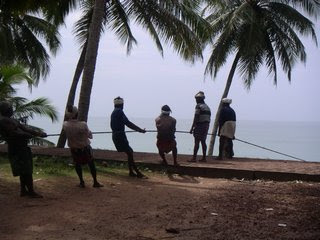 About 20 men would pull on each rope for many hours until the net was brought in and the fish collected. 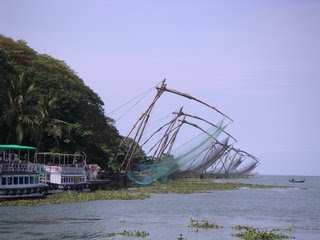 We saw another interesting fishing method in Fort Cochin at the start of our vacation. There was a swift current along the shore there so a net was set up with each corner attached to a frame of logs. The center of the frame was attached to a rope and pulley setup with stones attached as a counter b alance. 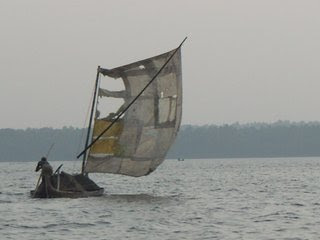 When they were ready to pull in the net, the men pulled on the rope with the stones and the frame closed like an umbrella, collecting the fish in one small section of the net.